Makaton is designed to support spoken language – signs are used with speech, in spoken word order to help children and adults to communicate. Using signs can help children who have no speech (either because they have communication difficulties or are very young) or whose speech is unclear. Makaton club is open to all pupils from Reception to Year 6. The aim of the club is to teach children everyday signs which will enable them to have basic conversations using the signs that they have learnt. We aim to teach Makaton through fun games and activities as well as videos by Mr Tumble. As the children progress through the signs they will achieve special certificates which they will receive in assembly. The club will take place in Miss Gill's classroom on Wednesday lunch times at 12:30. The club is run by Miss Walton and supported by Miss Gill. What a great first week of Makaton Club! To begin the session we learnt "My name is (name)" and the children went around the group introducing themselves, some children even had a go at signing "What is your name?". After, we learnt to sign the alphabet and played a Simon Says game to see how many letters we could remember. The children were absolutely FANTASTIC and picked the signs up quickly. To finish the session we learnt the sign of the week, which is 'socks' (see the video above). Well done to all those that attended Makaton Club, Miss Walton and Miss Gill are very excited to see you all next week! Another great turn out at Makaton Club this week! During this session we learnt the signs for members of our family. We learnt mummy, daddy, brother, sister, grandma and granddad. The children then applied what they learnt last week to ask each other the names of the people in their family. What a great two weeks of Makaton Club! Over the past two weeks we have been learning how to sign different verbs. We had to use our super signing to tell our teddies to do different actions, we then had to decided whether our teddies were going to the actions fast or slow and sign this as well. 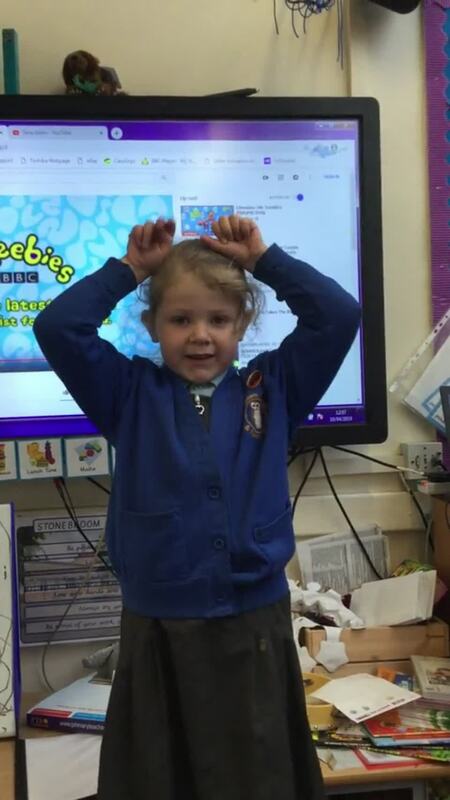 We have also been learning Mr Tumble's Hello Song. We can't wait to see you all again after the Easter holidays!